Honey Lust is my glitzy go-to glitter shadow when I want to shimmer like Tinker Bell but don’t want to deal with the drama of a pigment. 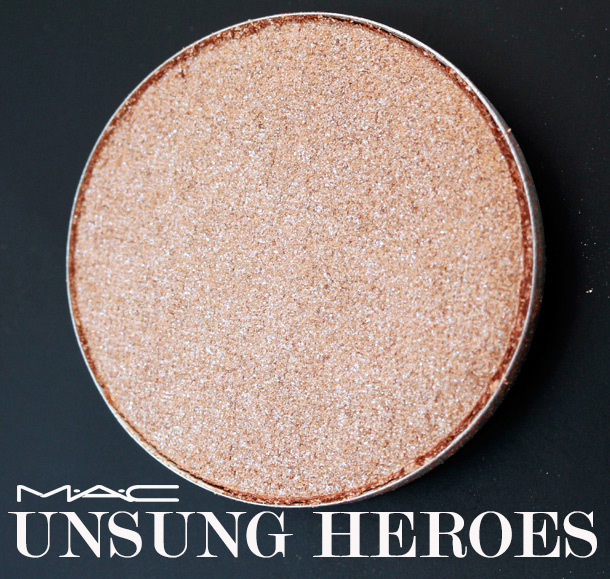 It delivers the glittery shimmer fix of a MAC loose Pigment without (necessarily) making a mess. Now, because Honey Lust isn’t chintzy with the glitter, it does tend to be grittier than many of MAC’s other shadows, so fallout can be an issue, especially if you’re using it with a fluffy brush like the MAC 217. I try to always use it with a brush that has a flat, firm brush head like the MAC 239, with which I can really pack the powder on my lids, and keep it from flying all over the place. This Honey brings the bling! — and I think it looks particularly fetching on warm skin tones and tans, especially paired with looks featuring summery bronzes, warm browns, golds and teals. A lot of the time I like to just wear it straight-up on my lids atop my trusty NARS primer, with black liner on my water lines and lots of mascara, but when I want even more glitz and glam, I’ll apply it with a 239 brush wet with MAC Fix+, which really cranks up the shine and the intensity of the peachy bronze color. Again, because of how much glitter we’re talking about with Honey Lust, it has a bit of grit to it, so if you plan to apply it with a wet brush some of the time, you might want to try this: pick up the shadow from a designated spot in your pan, because these Lustre shadows can harden and get chunky after repeated encounters with a wet brush head, so if you still want to be able to wear it dry from time to time, this helps. Honey Lust is so much more than a beautiful summer shade. Paired with darker khakis and deeper emerald greens, it’s totally ready for holiday/fall. It’s available now for $15 a pan (or $12 for the Pro Pan refill up at the top) on MAC counters, in stores and online. Next Post: Where Are Your Favorite Places to Shop? This looks amazing! I’m going to have it to add it to my MAC list! It looks like the sort of shade I wear on a regular, day to day basis. This is my kind of shade! It’s like my skin but better look. Thanks Karen! I can’t believe I’ve never heard of this eyeshadow! It’s exactly the type of shade I’ve been looking for because it’s so simple but makes any look more glam! Kelly recently posted … I tried nail stickers…and I liked it! You’ll love it. If you like this one try Woodwinked or Soba, too. Love this shade! I just picked up Honey Lust on a whim this week and wore it for the first time today. 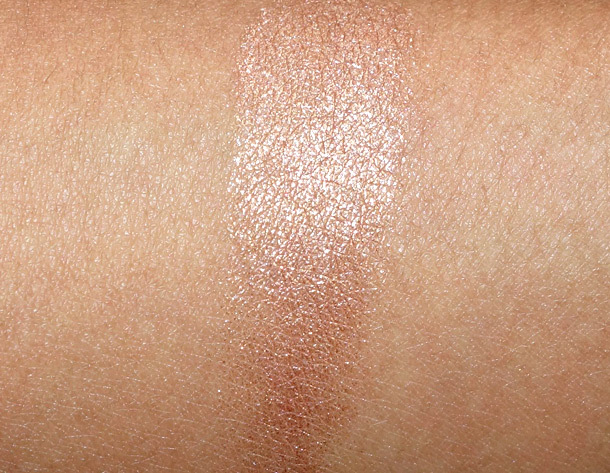 It’s just an awesome glitttery but not over-the-top shade that means it will surely be one of my favorites! This is one of my tried and true favorites – I haven’t worn it in a while but will now have to re-visit. My old boss always complimented me on this, and it was VERY hard to get a compliment out of her! What do you usually wear it with? I’m a big fan of this with a little Mulch or Bronze in the outer corner. Actually I think it was the Mulch combo that got the compliments. I also like it with a bit of Bottle Green! So pretty! I cannot believe that I don’t already owe this one. The shade is lovely, my Mum has this and I’d tried it out on my last trip home. What I don’t like is the gritty texture and the fall out, not one of MAC’s best! What a great deal!!!! it looks great with your skintone!!! !